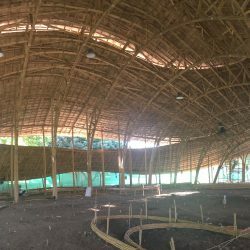 As Panyaden School is growing and at the same time changed to be Panyaden International School, it needed a bigger assembly space as well as an indoor sports facility. 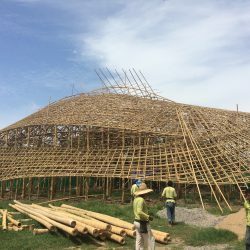 The school wanted to increase its facilities and protect the kids from getting too wet during the rainy season as well as from hot summer days thus the Panyaden School Assembly and Indoor Sports Hall was conceived. 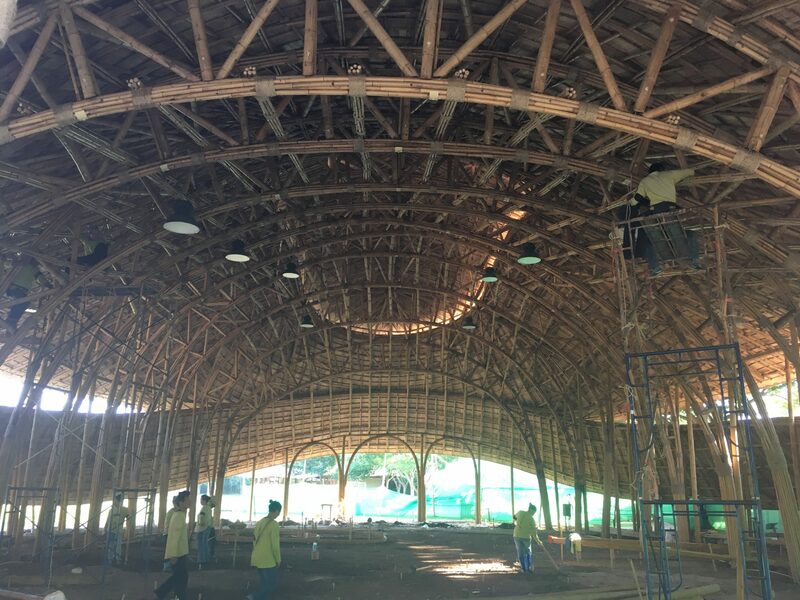 The hall should provide space for futsal, volleyball, basketball, and badminton. 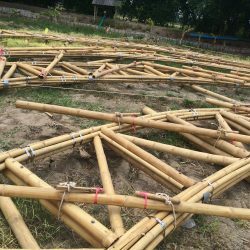 Besides the standard size courts there will also be game lines for 3 smaller mini-volleyball and badminton practice courts for smaller kids. 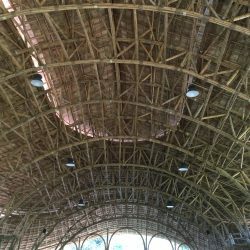 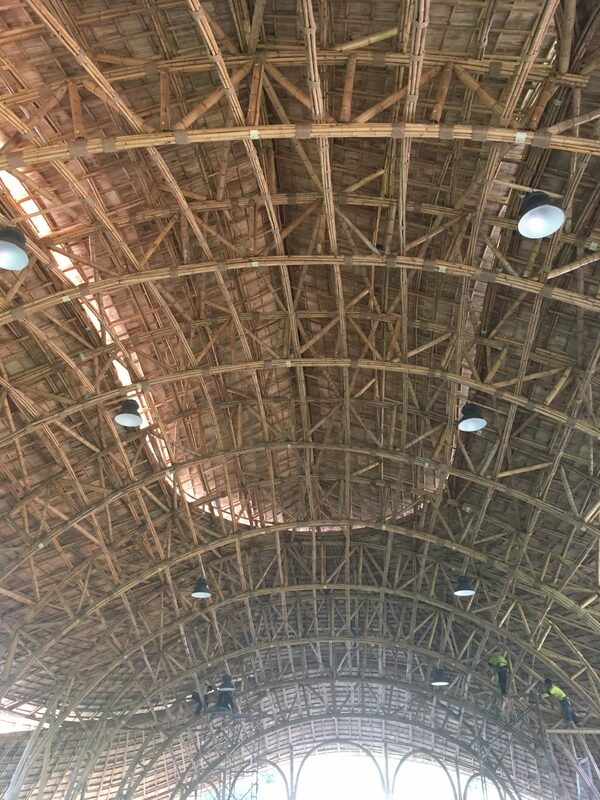 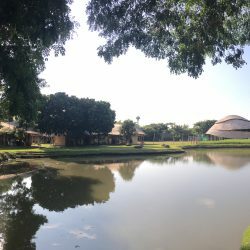 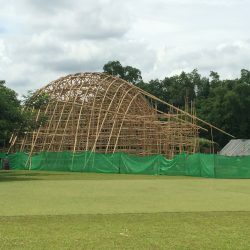 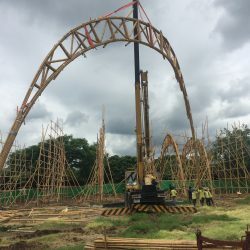 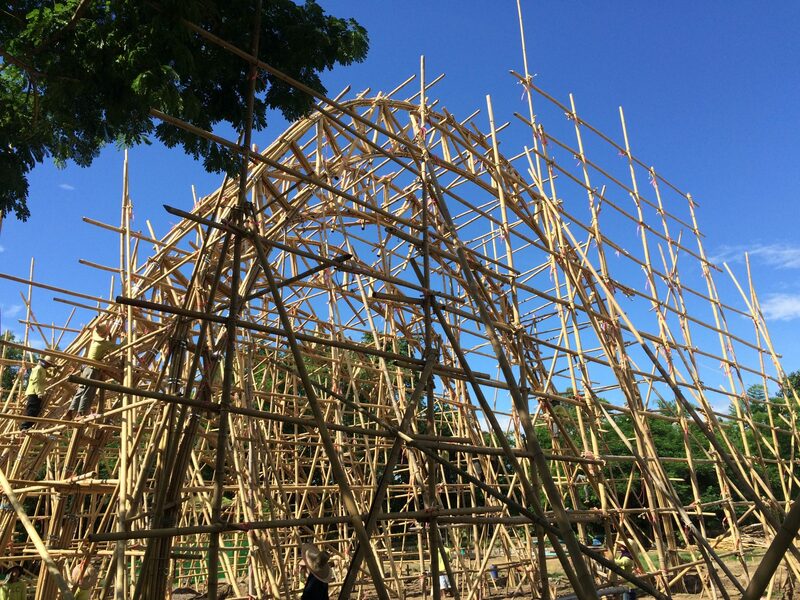 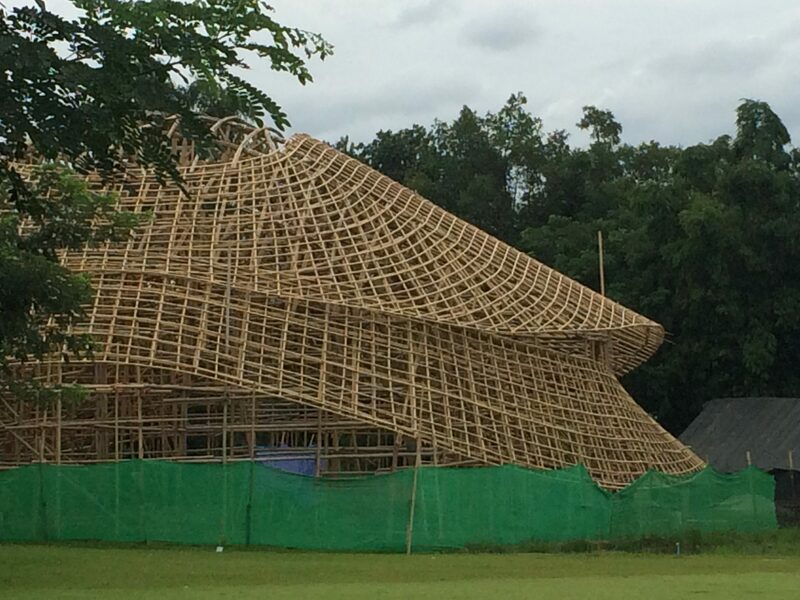 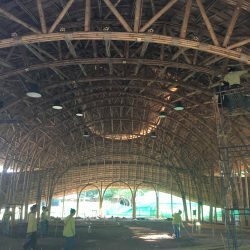 The architecture of the Panyaden School Assembly and Indoor Sports Hall is unique as pure bamboo trusses are used to create a span of 15 meters with an equal height without any steel reinforcements. 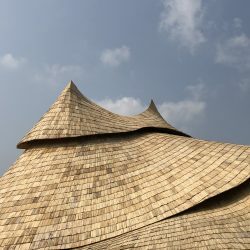 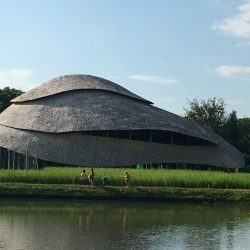 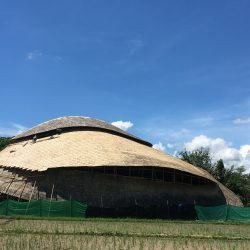 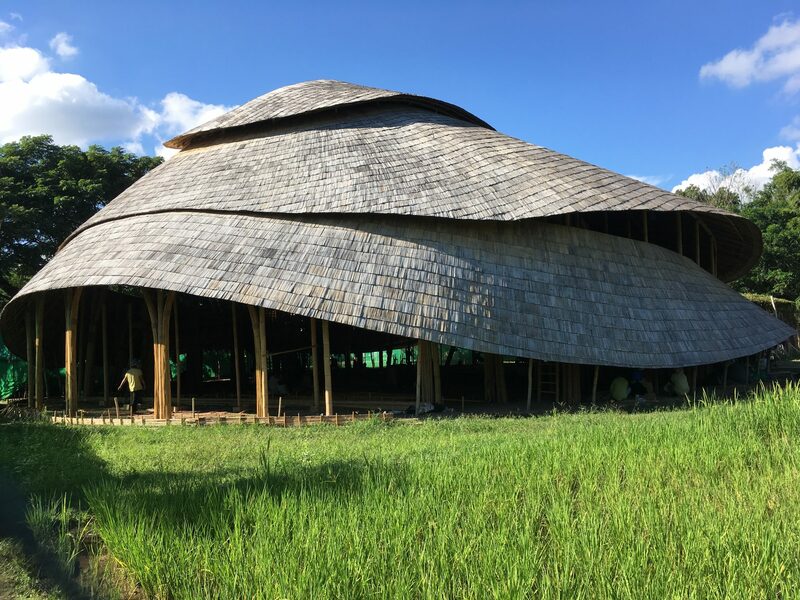 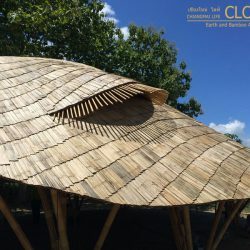 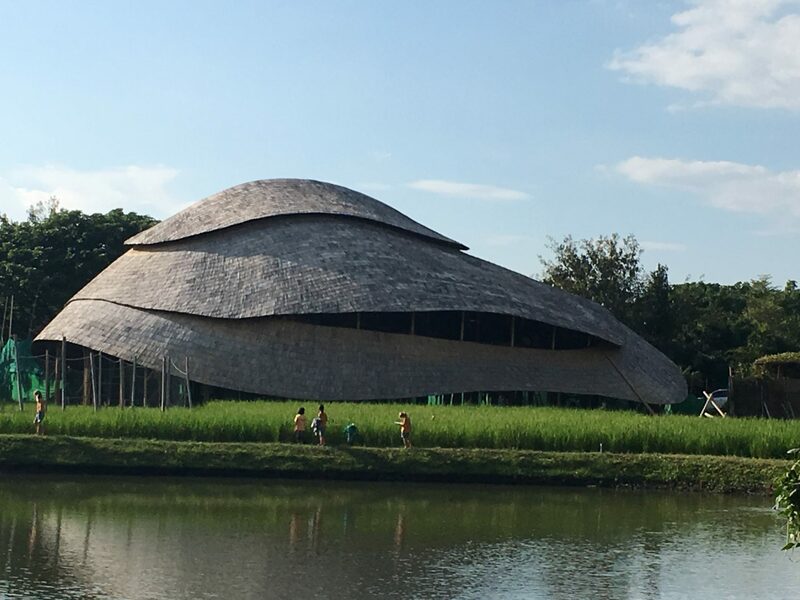 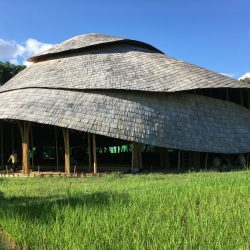 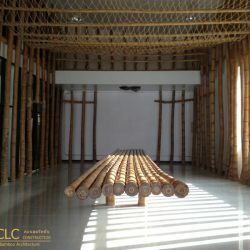 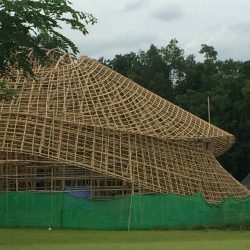 True to its core mission as a green school, the whole structure is made of well selected and treated bamboo and demonstrates the potential of this unique natural material. 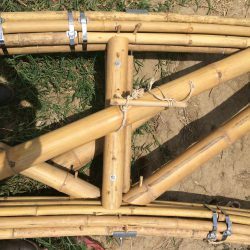 Two engineers were used to carefully calculate the loads, tensions and sheer forces and designed the structure according to 21st century engineering practices. 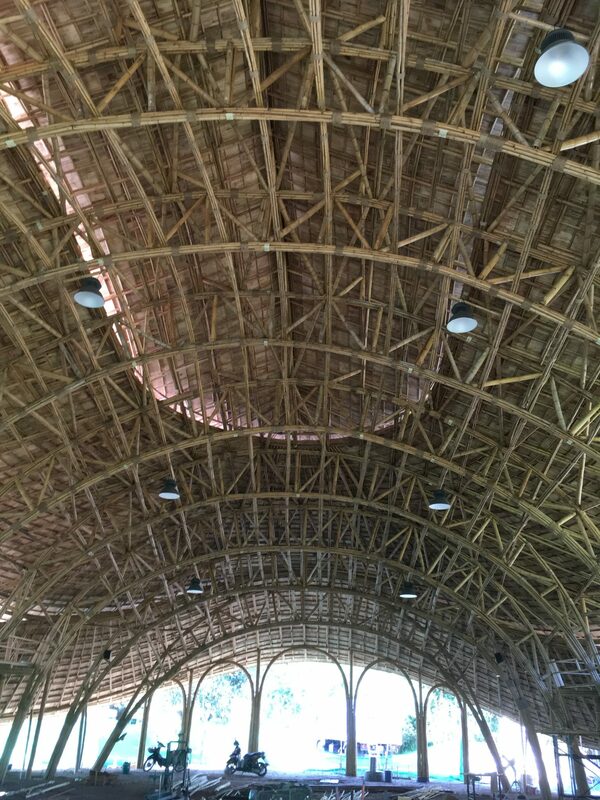 Huge bamboo arches create a space that is large and cozy at the same time. 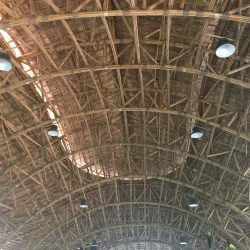 Ventilation is provided through openings between the three-layered roof. 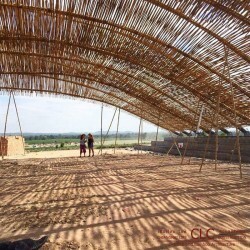 These openings also bring in light. 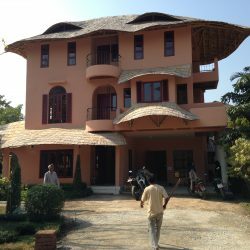 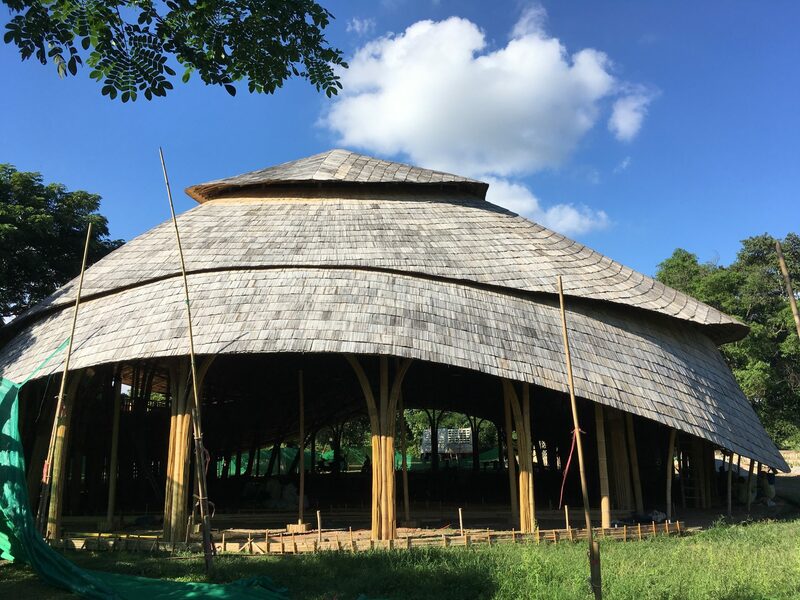 The design concept of the Panyaden School Assembly and Indoor Sports Hall originated from the lotus flower as the school is still basing it’s core teachings on Buddhist educational principles. 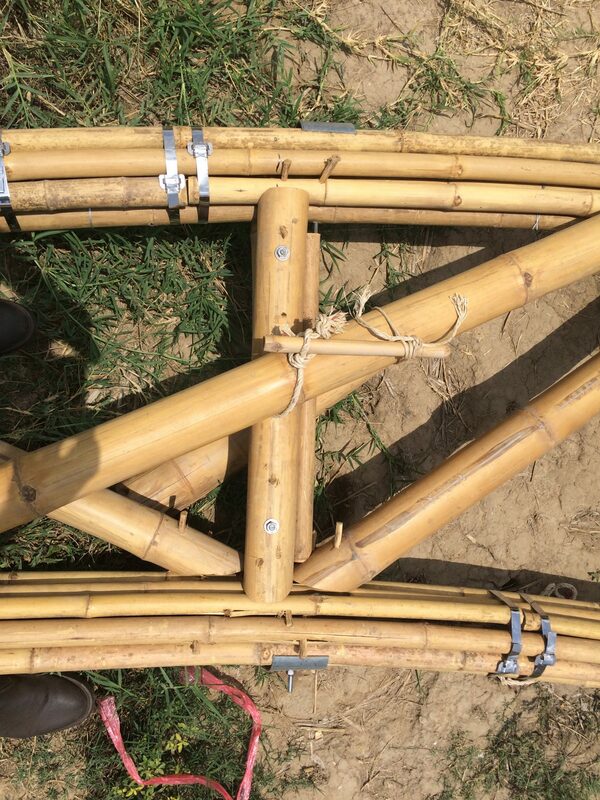 Here we show the design and construction process. 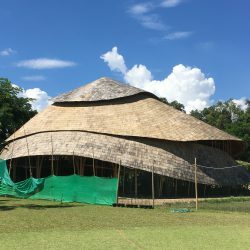 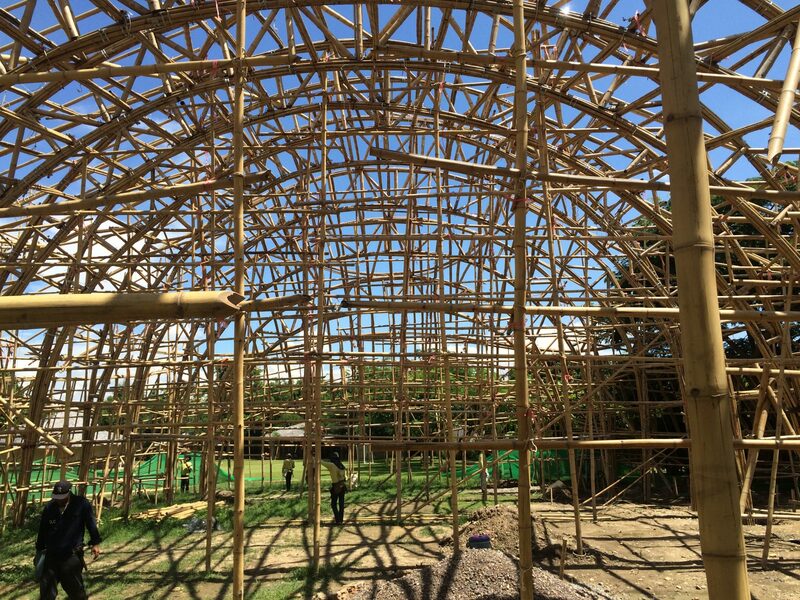 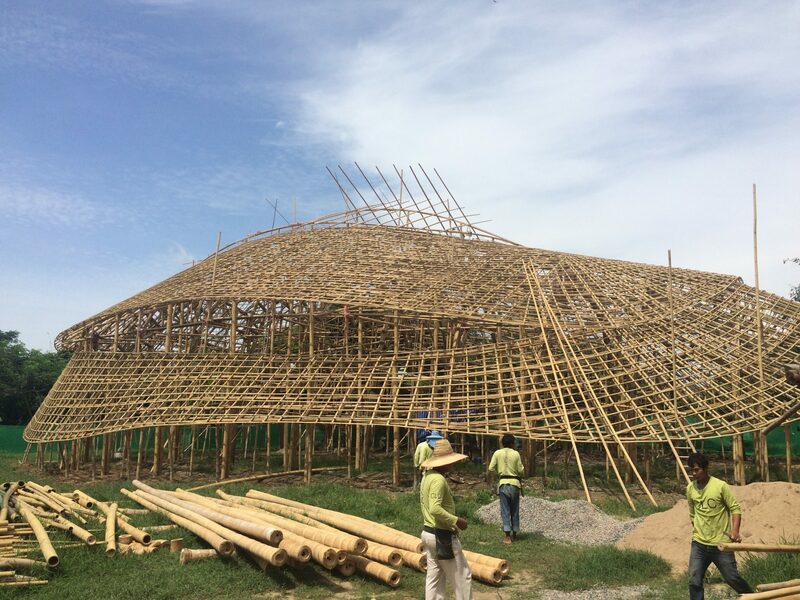 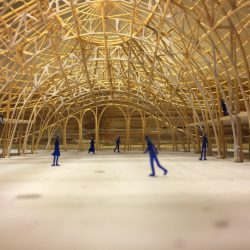 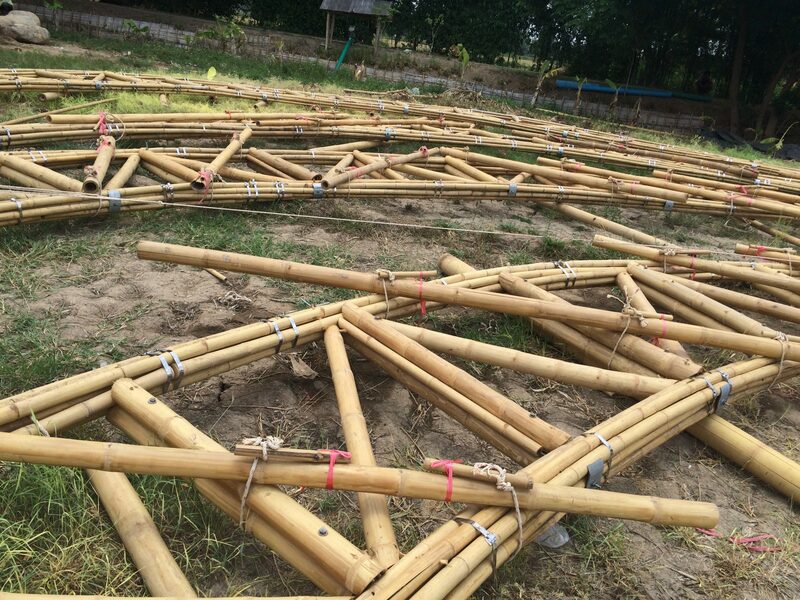 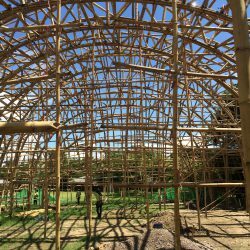 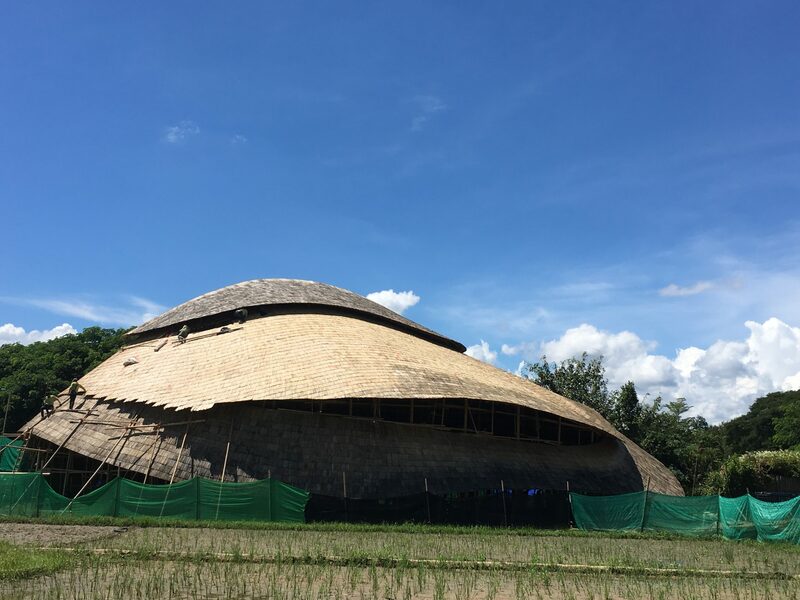 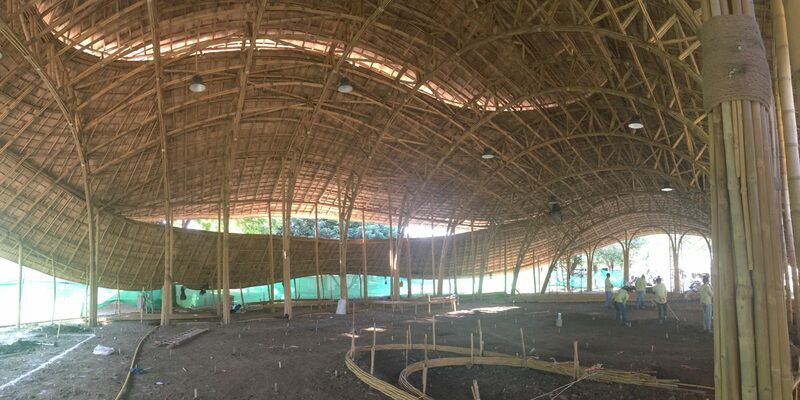 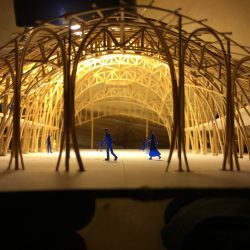 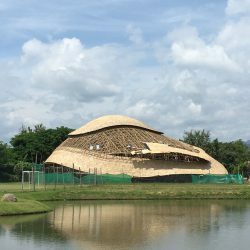 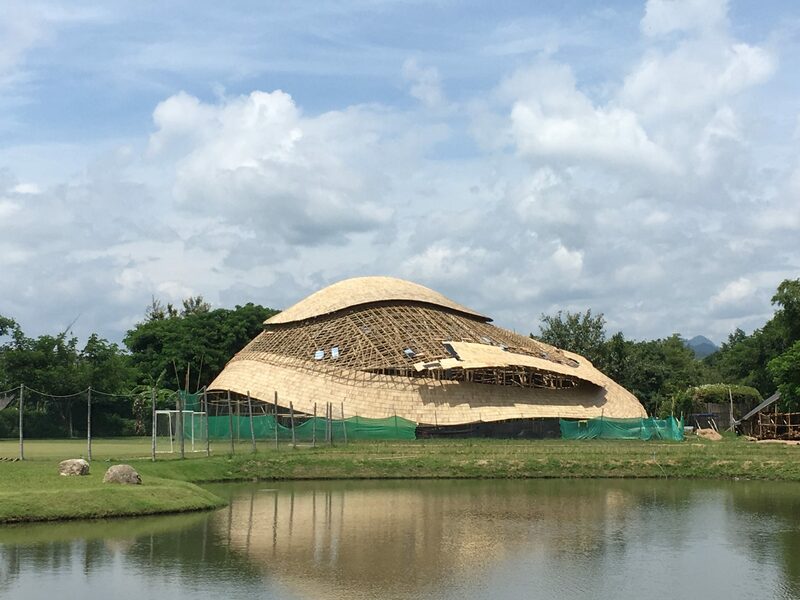 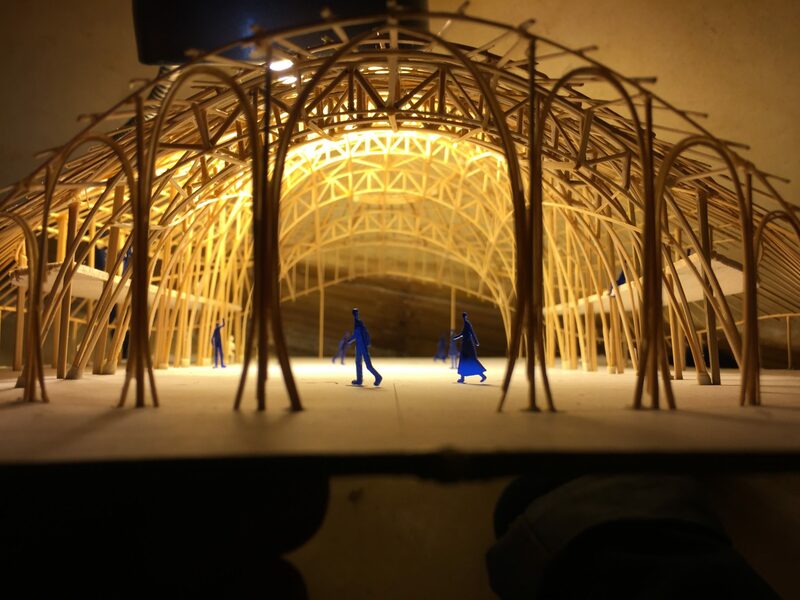 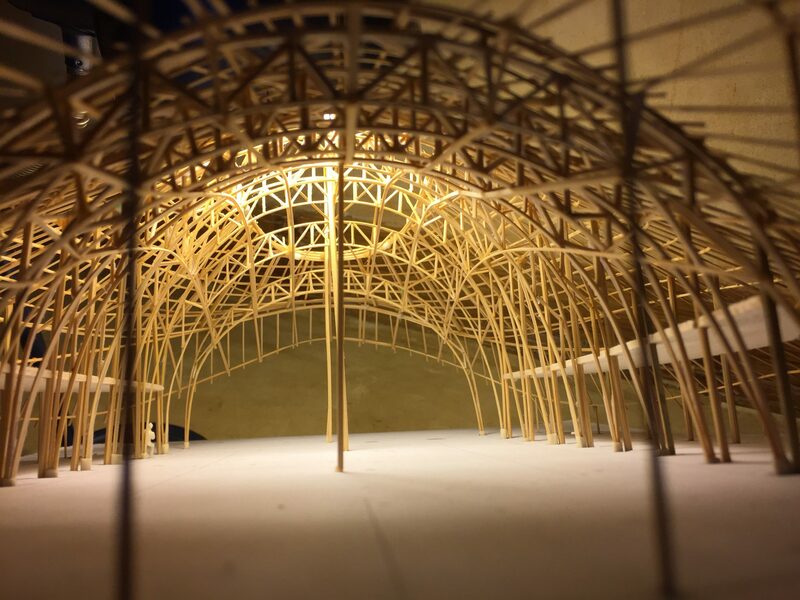 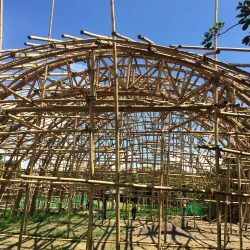 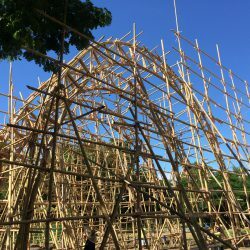 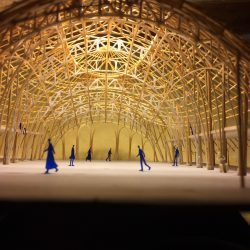 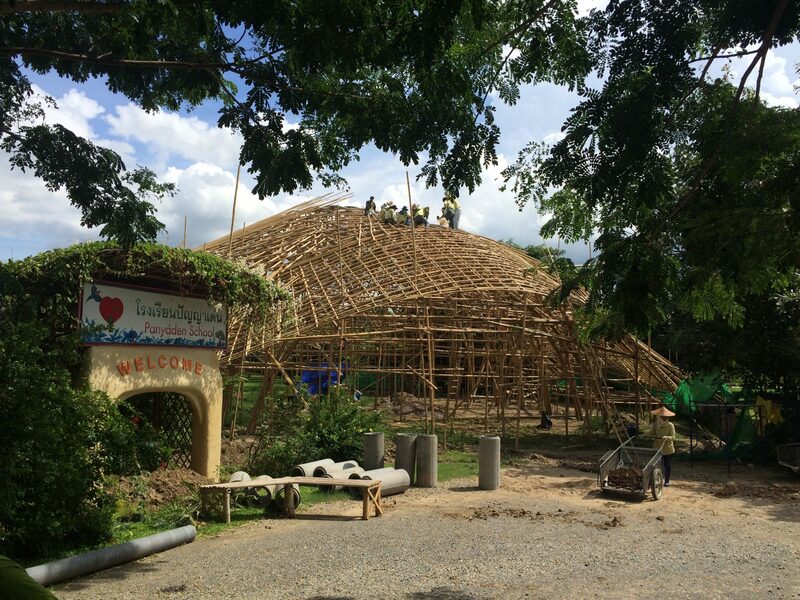 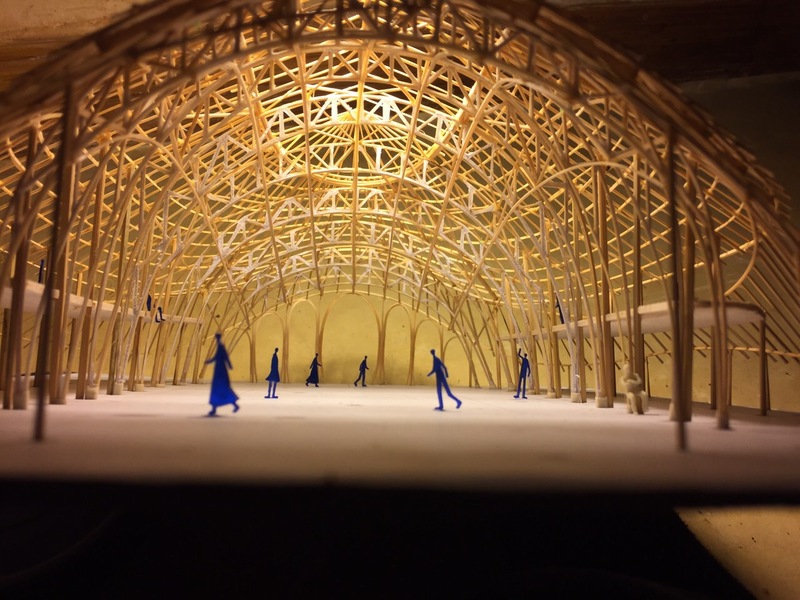 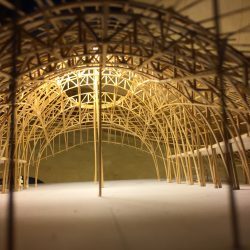 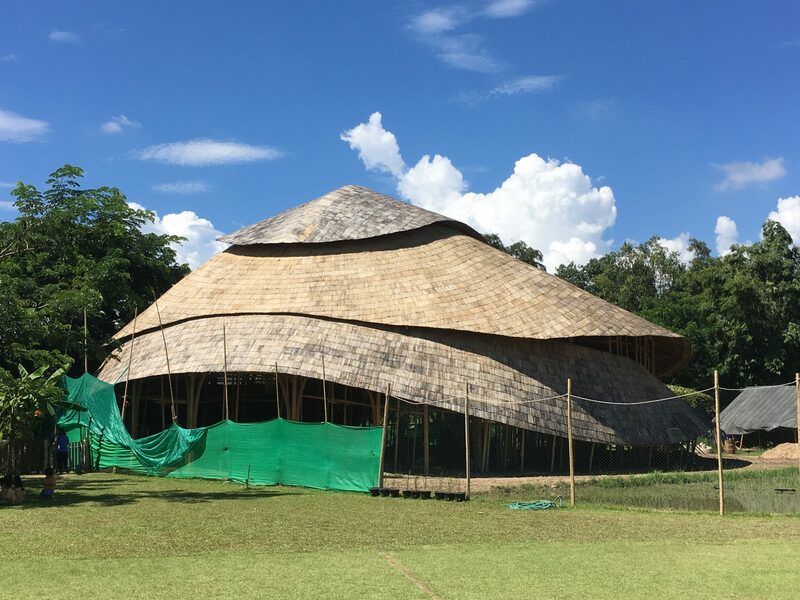 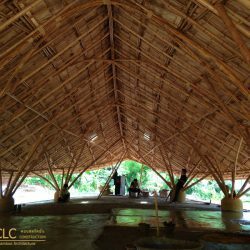 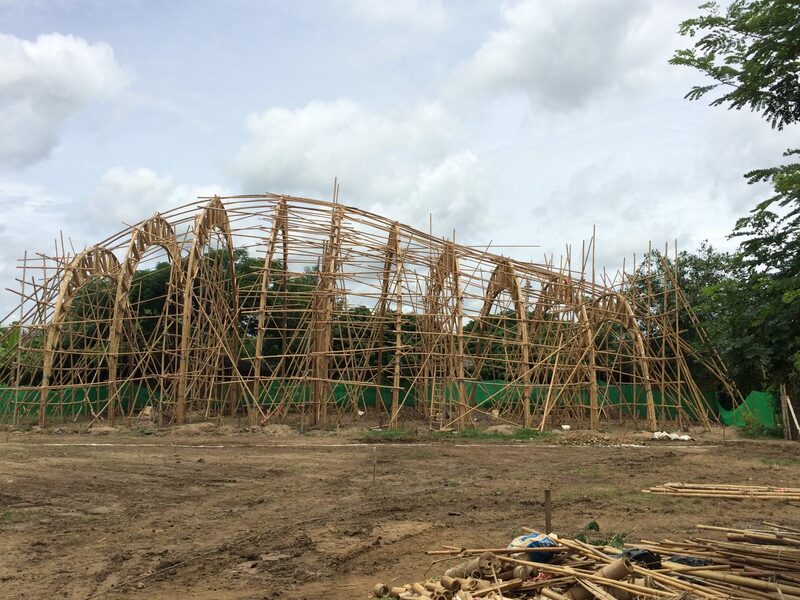 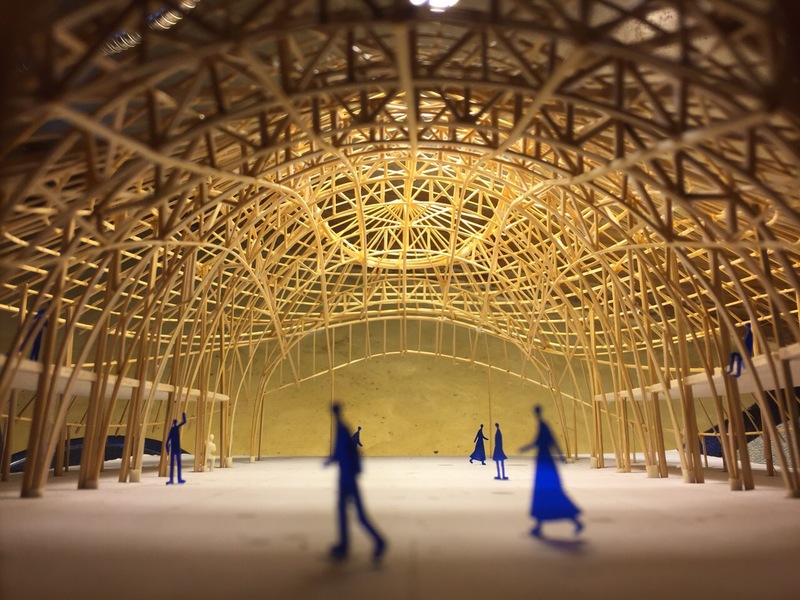 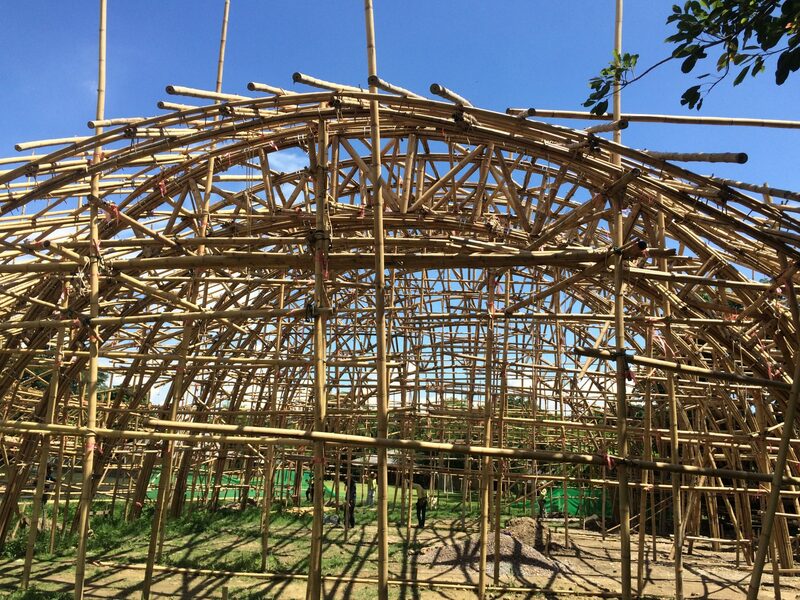 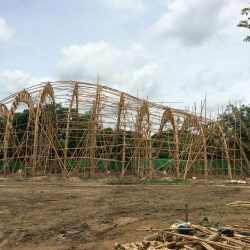 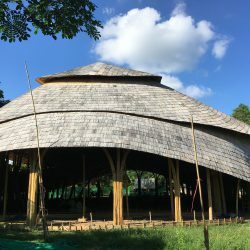 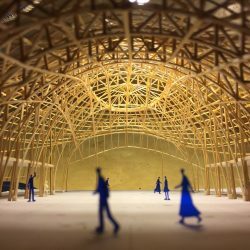 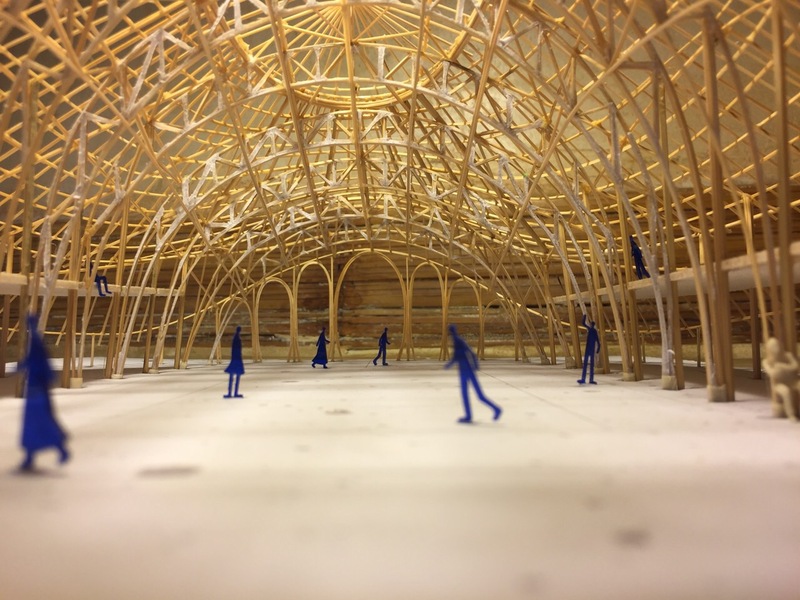 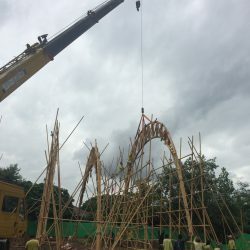 An exact model of the Panyaden School Assembly and Indoor Sports Hall was made with little bamboo sticks not only to show the project to the client but also to better understand structural issues and to communicate the construction process to the crew. 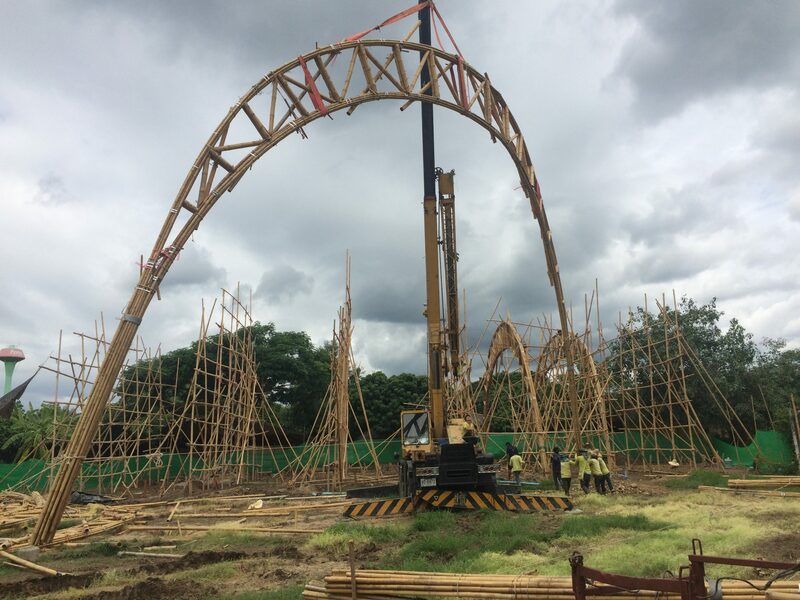 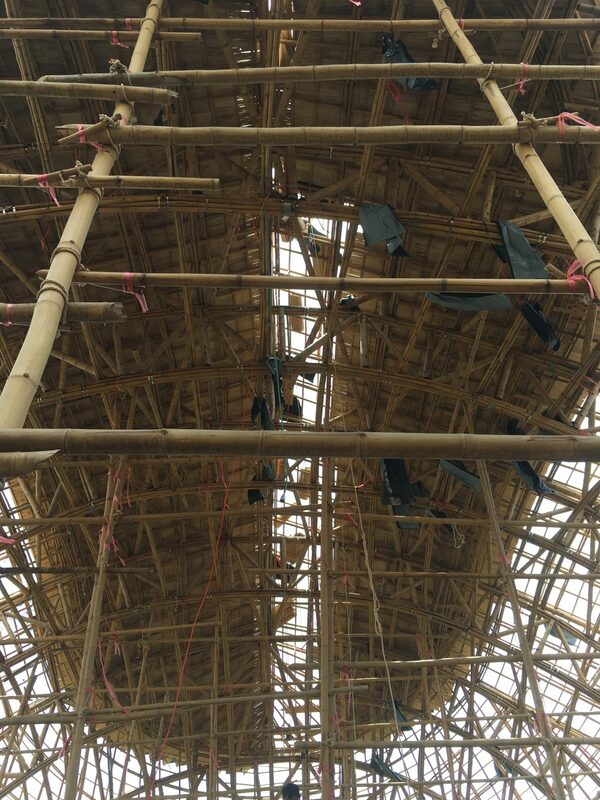 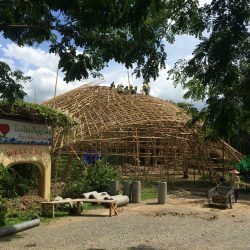 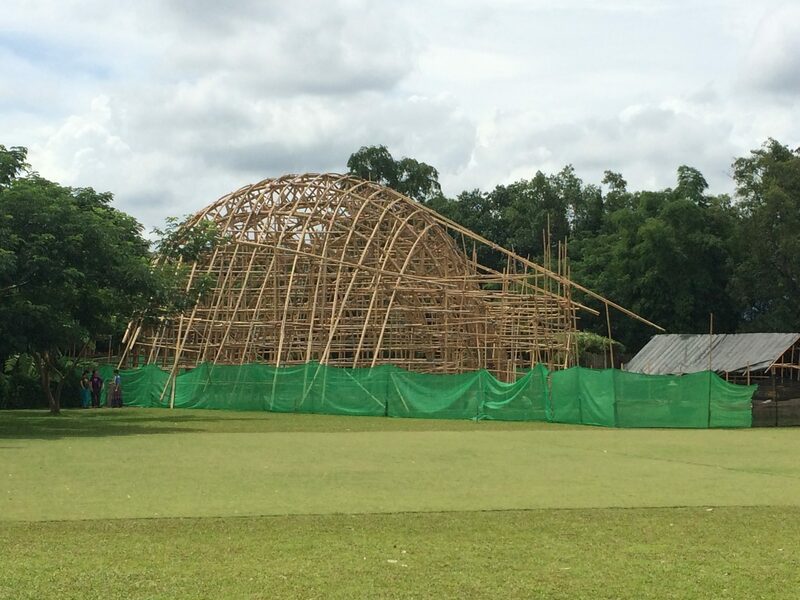 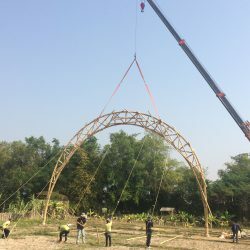 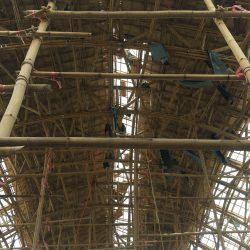 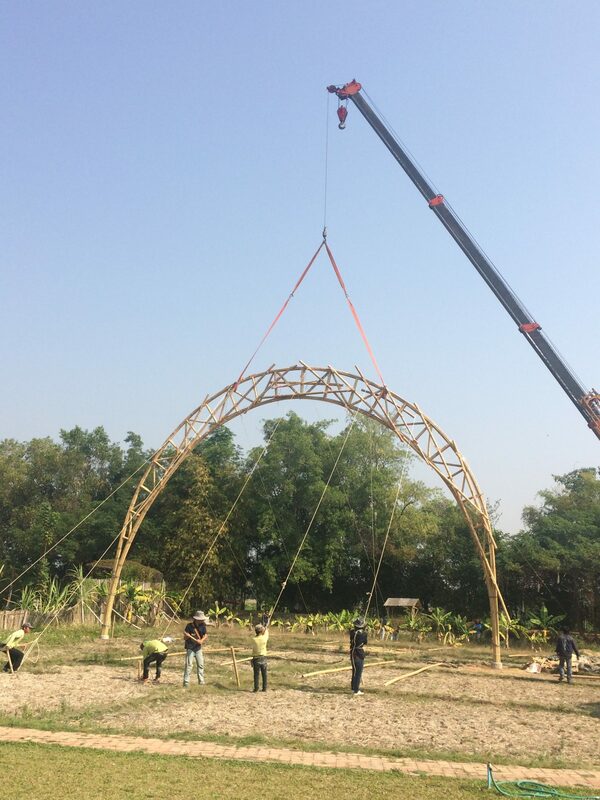 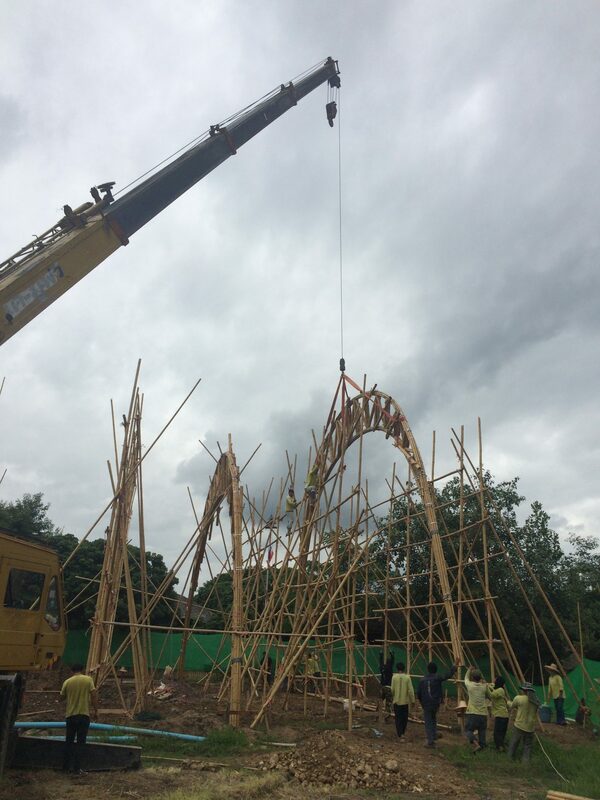 The bamboo trusses were pre-built on the floor, foundations were prepared and the trusses then lifted into place by a crane.